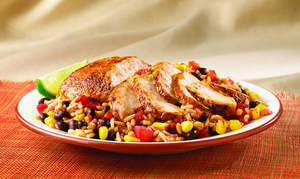 MISSION, KS--(Marketwire - Sep 13, 2012) - (Family Features) Between carpool, soccer practice and music lessons, the school year leaves little time for parents to make mouthwatering family meals. In fact, it's often difficult to wrangle everyone together -- let alone get them excited about dinner. Flavorful favorites. When schedules are crammed, it's time to revisit family favorites that everyone at the table can agree on -- like chicken. To take it over the top, pair this all-time classic with another delicious staple. With a blend of seven vibrant herbs and spices, Lawry's Seasoned Salt is the secret weapon of your spice cabinet, adding that unmistakable zing your family craves. Whether you're serving up drumsticks or tenders, chicken seasoned with Lawry's is an instant hit. Have fun with it. Meals should be as much about family fun and togetherness as they are about food -- so make tonight's dinner a special one. Try making simple, playful changes to your routine: host themed nights like Tex-Mex or Italian or serve breakfast for dinner. Sprinkle hash browns and eggs (any style!) with your favorite spice blend to take your breakfast staples to the next level. Keep it simple. Need a flavorful dinner on the table in less than thirty minutes? A durable skillet is your best friend. Whether it's a quick stir-fry or bold Southwest Skillet Chicken and Rice, one-dish meals provide amped up flavor and cut down on prep and cleaning, freeing you up to enjoy more time around the table with your family. For more flavorful recipes, visit www.lawrys.com. Mix chili powder and seasoned salt in small bowl. Sprinkle chicken with 1 teaspoon seasoning mixture. Heat oil in large nonstick skillet on medium heat. Add chicken; cook 5 minutes per side or until lightly browned. Stir in beans, tomatoes, corn, rice, water and remaining seasoning mixture. Bring to boil. Reduce heat to low; cover and simmer 5 minutes, or until chicken is cooked through and rice is tender. Let stand 5 minutes. Cut chicken into serving size pieces. Fluff rice mixture with fork before serving.